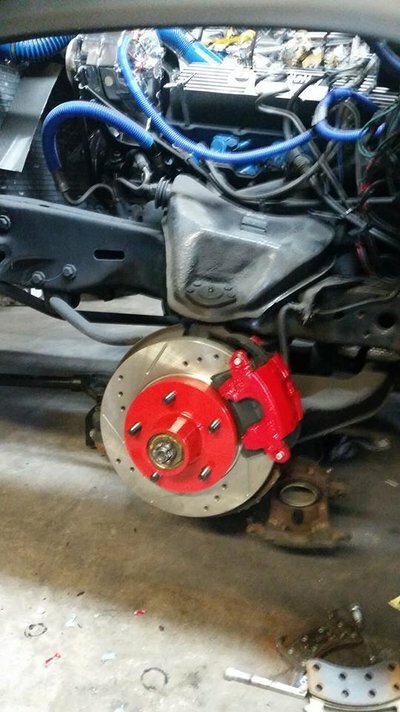 Power Stop S4071 - Power Stop Red Powdercoated Performance Calipers . Has anyone use them ? How do they compare to stock calipers ? I have Power Stop calipers on my TBSS and wagon (LS1 brakes F&R). Power Stop does make some notable updates/upgrades to an OEM caliper. I usually get them through eBay as they are cheaper than Summit and RockAuto. I had Power Stop rotors on my 02 Camaro SS and they were definitely no worse than stock rotors. Take that back. Actually better. The stock rotors warped too soon. Never had that issue with the Power Stops. That's my only experience and it was a good one. Very decent quality for the price IMO. I see there is a rotor and pad kit for the G body as well. Canadian Tire can get it for a similar price up here. I may upgrade and try the calipers as well at some point. I have the pad and rotor kit (for a Blazer) on the Pig; they seem to work well. No better or worse than stock calipers since that's what they are. Just red. put a set on my 90 Firebird formula and noticed a distinct improvement. pretty reasonable price too. i run them on my cutlass. have had them on it for couple years. they seem better than stock.